Knock out these must-do fall projects in just a couple of days and it’ll be smooth sailing in your home all winter long. To learn how to build this project and construction drawings click here. Strong winds or heavy use can crack the door jamb that holds the storm door closer in place. A jamb reinforcer can repair the cracked jamb, or stop the problem from happening in the first place. Learn how to fix your storm door closer here. When a house settles, doors sometimes stop latching properly because one side of the frame has sagged. You can fix the problem easily with a rotary tool and a metal-cutting bit. Follow these simple step-by-step instructions to get the job done right. One day the door closes smoothly; the next day it’s sticking. And the sticking grows worse as the weeks pass. It’s a common old house problem, but it can happen anywhere kids hang from doorknobs. The screws holding the top hinges carry most of the weight of the door and are almost always the first to pull out, especially after they’ve been repeatedly tightened over the years. Here’s the best way to fix those loose hinges and beef them up. Sliding doors get sticky and hard to open when the wheels are out of adjustment or the track gets dirty. Here’s how to repair your sliding door and replace a flimsy screen. Windows screens, mosquito nets, and similar barriers protect against inquisitive summer and fall pests, but only if they provide complete protection. And as long as the frame is in good shape repairs are easy and can be done in a few minutes. Here’s how to make your screen door or window look good as new. If your furnace quits or breaks down try these eight simple furnace solutions before you call for service help. You can solve the problem and avoid a $200 service call. Vinyl siding repair is tough, but not indestructible. If a falling branch or a well-hit baseball has cracked a piece of your siding, you can make it as good as new in about 15 minutes with a $5 zip tool (available at any home center) and a replacement piece. It’s as simple as unzipping the damaged piece and snapping in a new one. Here’s how to replace your damaged siding. If you have big gaps along the latch side of your doors, they were probably prehung in their frames at the factory and installed as a unit. The installer should have adjusted the frame with shims to leave about a 1/8-in. gap along the latch side, about the thickness of two quarters (coins). Sometimes the gap is far too wide. Here’s how to shim gapping doors. A common cause of poor drying is a clogged lint filter. The filter may look clean, but it may actually be covered by a nearly invisible film caused by dryer sheets. This film reduces airflow and forces the thermostat to shut off the heat before your clothes are dry. Test your filter by pouring water into it. If the filter holds water, it’s past time to clean it. Pull out the filter and scrub it in hot water with a little laundry detergent and a stiff kitchen brush. Also check the outside dryer vent for any lint that may have built up there. If your lock turns hard or your key doesn’t slide in smoothly, the lock might be worn out. Then again, it may just need lubrication. Squirt a puff of powdered graphite into the keyhole. Unlike liquid lubricants, graphite won’t create sticky grime inside the lock. A tube costs about $3 at home centers. There are lots of ways to create more storage space in your garage, but you won’t find another system that’s as simple, inexpensive or versatile as this one. It begins with a layer of plywood fastened over drywall or bare studs. Then you just screw on a variety of hooks, hangers, shelves and baskets to suit your studs. And because you can place hard- ware wherever you want (not only at studs), you can arrange items close together to make the most of your wall space. As your needs change, you’ll appreciate the versatility of this storage wall too; just unscrew shelves or hooks to rearrange the whole system. When it comes to energy savings, few upgrades pay off as quickly as a programmable thermostat. If you turn down the heat 5 degrees at night and 10 degrees during the day when no one is home, you’ll cut your energy bill by 5 to 20 percent. If you raise the temperature the same amount during the cooling season, your savings will be similar. You can do this with a manual thermostat, but a programmable model never forgets to turn down the heat at night and it can raise the temperature before you get out of bed in the morning. We show you how to install a programmable thermostat quickly and easily. Plugging these leaks is a time-consuming job: You have to pull off the interior trim, seal around the jambs and then reinstall the trim. But if your doors and windows are otherwise fairly airtight, the payoff can be big too. Stopping drafts not only makes your home more comfortable but also cuts energy bills. In just a couple of hours, you can seal and insulate your rim joists, which are major sources of heat loss in many homes. This project will help lower your heating costs and save you money. Insulating the rim joists is one of the best things you can do to make your home more energy efficient. And it’s easy, too, so anyone can do it. Learn how to insulate your rim joists here. If you live in a snow-prone climate, getting your leaves up before the flakes fly is a good idea. You may think you know everything about this time-honored lawn care tradition but click here for five ways to make this job a little easier so you are fall ready. To ensure lush grass and a healthy lawn in the spring, fall is the best time to aerate. Aeration breaks up compacted soil to allow water and fertilizer to penetrate deep down into a healthy root system. A must do fall ready project. For more, check out our fall lawn care guide. Prep your fall ready garden now for less work in the spring. Remove any annuals that are past their prime and rake out any rotting leaves. To protect your garden pots from breakage due to freezing water, empty, clean and bring indoors for the winter. After that’s done, check out these 10 easy to build planters and start planning your spring building projects! It may be messy, but clogged and overflowing gutters can create a drainage problem over the long winter months. It will also encourage rot to form at the roof line. Be sure to wear gloves and practice ladder safety when completing this fall ready job. Winter can be hard going for birds in terms of finding food to eat. Be sure to refill your bird feeders now and make them fall ready. This will keep our feathered friends happy and fed for the winter. If you don’t have a bird feeder or house, creating one is a great indoor project over winter. A colorful garden in the spring requires fall ready planting. Plant early flowering plants in September where they can still take advantage of fall rains. Follow depth directions to avoid frost damage over the winter. Fluctuating temperature levels and moisture can wreak havoc on your driveway, sidewalks and steps. Take time to fall ready your steps by repairing cracks and holes now before a minor problem becomes a major issue. Often overlooked but essential to keeping your outdoor living space in tip-top shape is cleaning and storing your garden furniture out of the elements. Fall is also a perfect time to clean up any rust, repaint or repair your garden furniture so it looks great when you uncover it in the spring. If you aren’t the type to barbecue all winter, use the fall to get your grill ready for storage. Proper cleaning of parts and routine maintenance to winterize your grill will keep this essential piece of summer equipment ready for better weather. Locate all outside hoses and drain them for storage. Be sure to remove splitters or any other items from each outdoor faucet. If your hoses need to be replaced, this hose guide can help you find the best one for your needs. There’s nothing quite like curling up with a good book on a cool afternoon. 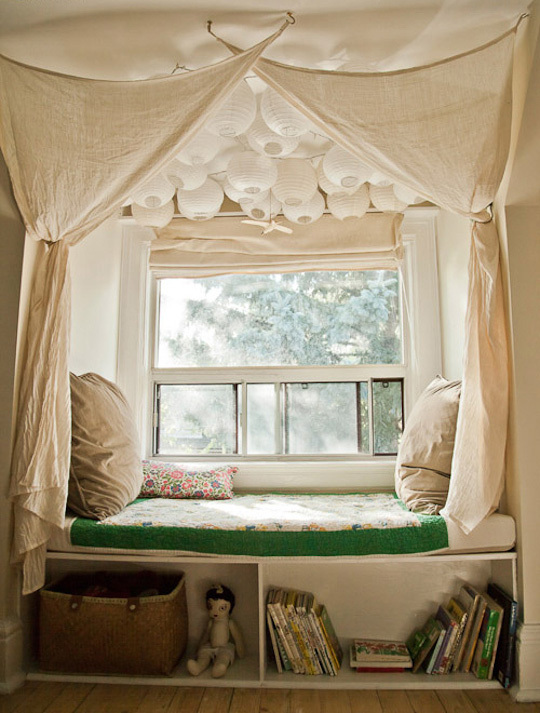 Find a sunny spot at home to set up a reading nook.